Let me just say, right off the bat, that he makes a helpfully important point in the first chapter – in what way was Jesus considered (a) god? In the Greco-Roman world, as Ehrman appropriately explains, there was no simple divide between the human and divine realms. Rather, there were tiers and people and entities could be plotted on a gradation. In his own words: “Divinity came in many shapes and sizes; the divine realm had many levels” (20). I think this chapter was useful because one needs to understand how Greeks and Romans would have perceived the works and claims of Jesus. For example, I often tell my students that Jesus’ miracles do not prove that he is “God” (he was not the only show in town). In fact, neither really does his resurrection prove so much (since “resurrection” the way Jesus did it was not a pre-loaded category). The whole package of Jesus’ advent (incarnation), life, death, resurrection, ascension and session made his status and identity clear (or so we Christians believe). So, I think Ehrman has clarified how Jesus would have been “placed” in a world of many different kinds of beings. But the major concern I have with this chapter is its direct relevance to how the Jewish disciples of Jesus would have considered Jesus “God.” This is what he treats in chapter two, but it still places a question mark on what he is proving in chapter one. OK, so what about chapter two? Ehrman sets out to prove that, despite the fact that most Jews of the first century were monotheists, they still seemed to have thought it possible for people and entities (like angels) to fall along roughly the same stratification of human to divine as in the Greco-Roman theo-cosmology. He picks up on issues related to this already in the OT: the Nephilim, the Angel of the Lord, even the exaltation of the human king (Ps 45). He also gets into the range of unique figures (angels, Son of Man, Logos, Wisdom) in early Jewish writings from places like Apocalypse of Abraham, 1 Enoch, and Philo. 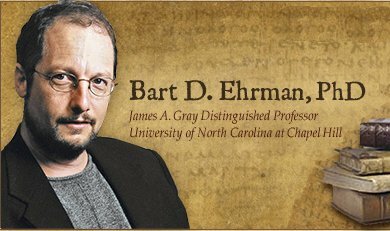 I think Ehrman does raise some helpful points – for example, the complex and unique way kings were seen in Israel (or the High Priest, for that matter, in Philo, a point Ehrman doesn’t make). But in the end he tries to flatten out the difference between Greco-Romans and Jews by saying, when all is said and done, Jews basically held to the same tiered system of the human-divine world that pagans did as well (see his conclusions on pg 83). He remarks that first-century Jews “believed that there was only one God Almighty [but] it was widely held that there were other divine beings –angels, cherubim, seraphim, principalities, powers, hypostases. Moreover, there was some sense of continuity–not only discontinuity–between the divine and human realms” (83). I have several problems with this chapter (far more concern than with the first chapter). #1: Jews simply did not slap the label of “god” on various entities in the way Greeks and Roman did, so we need to be very careful about comparing their theo-cosmologies. #2: It is true that sometimes we see Jewish writers use “god” language for a variety of people/angels/ideas. However, almost always Ehrman points to examples in Jewish literature that look nothing like the Gospels. For example, Ehrman tends to rely on Jewish apocalypses, but these texts are notoriously grandiose and visionary – it is hard, in such texts (like Revelation also) to know when a writer is thinking merely metaphorically and when some literal element is expected (floating, burning, destroying, hair color, clothing, animals, etc…). Put another way, I bet a Jewish reader would interpret the divine-attributions of Jesus in John somewhat differently than they would Abraham or Moses in an apocalypse (by virtue of genre). #4: Erhman appeals to examples in the OT and early Jewish literature where the Angel of the Lord becomes human (55-57). I admit it is difficult to pinpoint the status and nature of the Angel of the Lord in the OT. But I think Ehrman is wrong to label this figure as both divine and human. In what sense is the Angel of the Lord a human? It makes more sense to think the Angel appears to be human. Think about Tobit (which Ehrman makes no appeal to) where it is made clear the angel Azariah only appears to be human and it is explained that, when he was eating and drinking, it was all pretend (because, huzzah!, angels don’t eat and drink). Now compare that to the strong emphasis that the very human Jesus eats and drinks and sleeps and gets tired before his death, and that he spends quite a lot of time eating after his resurrection (let alone he has real scars). Last couple of comments of an introductory nature: Ehrman, I don’t think, is clear about what his purpose is in the book. Sometimes he seems to come across as the agnostic who wants to challenge the divinity of Jesus (as if an enemy of Christians from an academic standpoint). At other times, he seems like he is trying to be a “mere historian” who is simply wanting Christians, whatever their beliefs, to know the evolution of the early Christian understanding about the divinity of Christ. I think this muddled approach leads to confusion about what exactly Ehrman is arguing. Perhaps a bit more off-putting is what seems like name-dropping – how he travelled with his buddy Dale Martin of Yale. You might think – well, he’s simply mentioning who he went with. Fair enough. But did you know “Yale” appears in the appendix once and notes one place in the book – the place where he mentions Dale Martin as his traveling colleague (with Martin contributing nothing to his thoughts on Christology in the book)? Why would someone need to look that up in the appendix? I don’t want to end on a negative note – let me say that I am going to use this book as a textbook in my Christology course and I really want my students to grapple with the complexities of Jewish and Greco-Roman beliefs that Ehrman identifies. His first chapter, on Greco-Roman understandings of divinity, is largely, for me, an informative and interesting essay. Even his second chapter on Jewish belief has some important points. I think he has run the risk of over-simplifying, but I want to give him credit where it is due. Next up, I will turn to the evangelical response book and walk through their reaction to these first two chapters from Ehrman (see Bird et al, How God Became Jesus, Zondervan). Excellent work Nijay! Very much appreciated. Bingo, we’re singing off the same sheet of music man!